Mycobacterium tuberculosis complex (MTBC) and Non-tuberculosis Mycobacterium (NTM) infections differ clinically, making rapid identification and drug susceptibility testing (DST) very critical for infection control and drug therapy. This study aims to use World Health Organization (WHO) approved line probe assay (LPA) to differentiate mycobacterial isolates obtained from tuberculosis (TB) prevalence survey in Ghana and to determine their drug resistance patterns. A retrospective study was conducted whereby a total of 361 mycobacterial isolates were differentiated and their drug resistance patterns determined using GenoType Mycobacterium Assays: MTBC and CM/AS for differentiating MTBC and NTM as well MTBDRplus and NTM-DR for DST of MTBC and NTM respectively. Out of 361 isolates, 165 (45.7%) MTBC and 120 (33.2%) NTM (made up of 14 different species) were identified to the species levels whiles 76 (21.1%) could not be completely identified. The MTBC comprised 161 (97.6%) Mycobacterium tuberculosis and 4 (2.4%) Mycobacterium africanum. Isoniazid and rifampicin monoresistant MTBC isolates were 18/165 (10.9%) and 2/165(1.2%) respectively whiles 11/165 (6.7%) were resistant to both drugs. Majority 42/120 (35%) of NTM were M. fortuitum. DST of 28 M. avium complex and 8 M. abscessus complex species revealed that all were susceptible to macrolides (clarithromycin, azithromycin) and aminoglycosides (kanamycin, amikacin, and gentamicin). Our research signifies an important contribution to TB control in terms of knowledge of the types of mycobacterium species circulating and their drug resistance patterns in Ghana. Sub-Saharan Africa accounted for about 28% of the estimated 9.6 million of all notified tuberculosis (TB) cases in 2014. The TB menace is further aggravated by the emergence of drug resistant strains which is a setback in TB control efforts. In Ghana, TB still poses a major public health concern with a total of 14,668 cases reported in 2014 . The Ghana National TB prevalence survey was conducted from March – December, 2013 to obtain useful estimates of TB prevalence within the time period. The adjusted prevalence of smear positive pulmonary TB and bacteriologically confirmed TB among adults aged 15 years and above were 111 (95% CI 76–145) per 100,000 population and 356 (95% CI 288–425) per 100,000 population respectively (personal communication with the programme manager for the National TB Control Programme, Ghana, unpublished data). Isolation of many Nontuberculous Mycobacterium (NTM) during the survey necessitated further investigations. Mycobacterium tuberculosis complex (MTBC) and Non-tuberculosis Mycobacterium (NTM) infections differ clinically, making rapid identification and drug susceptibility testing (DST) very critical for infection control and drug therapy . The use of simple, rapid and efficient tools for mycobacterial differentiation and DST such as World Health Organization (WHO) endorsed line probe assay (LPA) is much needed especially in developing countries with high TB burden and preponderance of environmental mycobacteria . One of such commercially available LPA is the GenoType Mycobacterium Assays (Hain Lifescience, Nehren, Germany) which have demonstrated high sensitivity and specificity in many studies for differentiating between species of MTBC and NTM as well as determining the presence of mutations in genes associated with drug resistance [4–6]. This study therefore sought to use LPA to differentiate mycobacterial isolates and thereafter determine their resistance to anti-mycobacterial drugs. To the best of our knowledge this is the first study in Ghana to genotype and determine DST patterns of both MTBC and NTM strains obtained from a nationwide TB prevalence survey. This study was a follow-up to the National TB prevalence survey conducted from March–December, 2013 to determine the actual burden of TB in adult population (≥ 15 years) in Ghana. The survey was cross sectional and community-based in 98 clusters in two strata (urban, rural) which were selected by stratified multistage cluster sampling based on probability proportional to size. All participants were screened using an interview about symptoms and chest X-ray as recommended by WHO . A total of 8298 participants were eligible for sputum examination, of whom 8126 (98%) submitted at least one sputum specimen and 7706 (93%) submitted two sputum specimens. This current study was done using culture positive mycobacterial isolates identified from the prevalence survey. 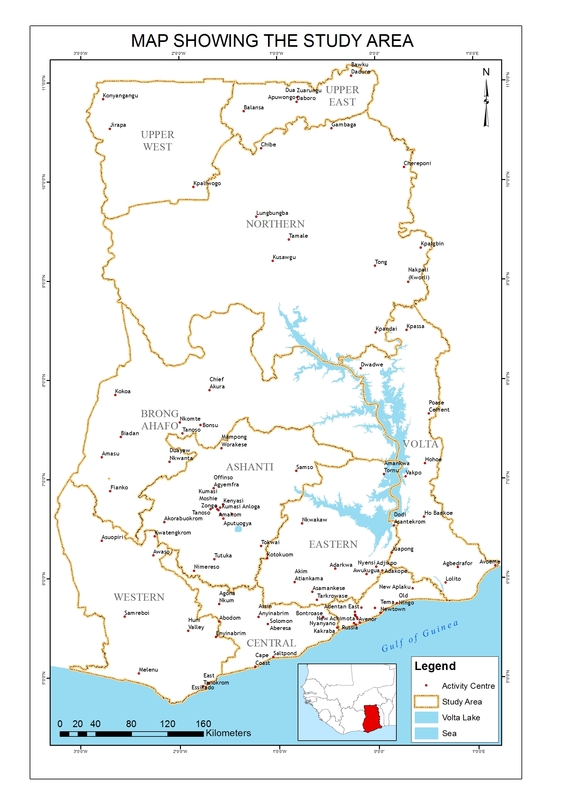 Additional file 1 represents the map of Ghana showing the study sites (clusters). All laboratory investigations were carried out in a Pathogen Level 3 (P3) Laboratory. Equal volumes of commercially available Sodium hydroxide-N-acetyl L-cysteine (NaOH-NALC)-Mycoprep (BD Diagnostic System, Sparks, MD, USA) was added to sputum in a 50 ml centrifuge tube. The mixture was vortexed and allowed to stand for 15 min at room temperature. Phosphate buffer saline (PBS) [pH = 6.8] was added up to the 50 ml mark and centrifuged at 3000 g at 4 °C for 15 min. The supernatant was discarded to obtain sediment which was reconstituted with 2 ml of PBS (pH = 6.8). An aliquot (0.5 ml) of reconstituted sediment was inoculated into two tubes of Mycobacteria Growth Indicator Tube (MGIT) and incubated in the BACTEC MGIT 960 (BD Diagnostic System, Sparks, MD, USA) for a maximum of 42 days. Once a tube flagged positive in MGIT, smear was prepared and Ziehl Neelsen (ZN) stained for the presence or absence of acid fast bacilli (AFB). Additionally, a portion of the positive culture was inoculated onto blood agar plates by streaking to check for contamination. All the positive mycobacterial isolates obtained were broadly identified as Mycobacterium tuberculosis complex (MTBC) and Non-tuberculosis mycobacterium (NTM) using BD MGIT™ TBc Identification Test Kit (BD Diagnostic System, Sparks, MD). The test detects the MPT64 antigen which is highly specific for MTBC. The test and interpretation of the results was done according to manufacturer’s instructions . All negative test samples were suspected NTM and confirmed using GenoType Mycobacterium CM and GenoType Mycobacterium AS (Hain Lifescience Nehren, Germany). The LPA procedure consisting of DNA extraction, master mix preparation, polymerase chain reaction (PCR) and reverse hybridization were performed in separate rooms. All the assays (GenoType MTBC; GenoType Mycobacterium CM; GenoType Mycobacterium AS; GenoType MTBDRplus, GenoType NTM-DR) were run according to manufacturer’s instructions [9–13]. Quality control of all the tests were ensured by using H37Rv strain and nuclease free water as positive and negative control markers respectively. The boiling (heat killing) method of DNA extraction was used. About 0.5 ml of thawed suspension of isolates was dispensed into a 1.5 ml screw capped micro centrifuge tubes. The tubes were placed in a heating block at 90 °C for about 1 h to disrupt the cell wall and release DNA into solution. The solution was allowed to stand for about 15 min without any form of shaking in order that the disrupted cells will settle down in the tubes. Next, the supernatant containing the mycobacterial DNA was carefully transferred into different tubes using Pasteur pippette and kept at −20 °C until used for PCR. Briefly, 10 μl of Amplification Mix A (AM-A) consisting of 5 μl 10× buffer, 2 μl MgCl2, 3 μl of molecular grade water and 0.2 μl (1 U) Taq DNA polymerase was mixed with 35 μl of Amplification Mix B (AM-B) made up of nucleotides, biotinylated primers and dye. Then, 5 μl of extracted DNA sample was added to the master-mix in another room. PCR amplification was done with the thermocycler set at the following cycling conditions: one cycle at 95 °C for 15 min, followed by ten cycles at 95 °C and 58 °C for 30 s and 2 min respectively. This was followed by another round of 20 cycles at 95 °C, 53 °C and 70 °C for 25, 40 and 40 s respectively before a final single cycle at 70 °C for 8 min. Hybridization was carried out with the GT-Blot 48® automated hybridizer (Hain Lifescience Nehren, Germany) in accordance with manufacturer’s instructions. Pre-heated hybridization and stringent buffers, diluted conjugate and substrate solutions, rinsing and sterile distilled water were placed into their respective colour-coded slots in the GT-Blot 48®. Then suction heads were placed into corresponding colour-coded solutions. Equal volumes (20 μl) of denaturing reagent and amplicons were mixed together in wells of a tray placed in the GT-Blot 48® and allowed to stand for 5 min at 25 °C. After denaturation, the test strips with sample identification numbers written on them were placed into corresponding wells. The automated process of dispensing and aspirating various solutions was set in a sequential order: hybridization, stringent wash, rinsing, conjugate, rinsing, sterile distilled water, substrate, sterile distilled water. The strips were then dried using the heating systems in the GT-Blot 48®. The fully dried strips were scanned using GenoScan® (Hain Lifescience, Nehren, Germany) which generated an automated read-out of the band patterns. The strips were pasted on evaluation sheets included in the kit. The final results on the read-out were verified manually with the naked eye. All the data collected were entered into Microsoft Excel 2013 (Microsoft Corporation, USA) for analysis. Results were presented in tables and graphs showing frequencies and percentages. Fisher’s exact test was applied to determine association between socio-demographic characteristics, with p ≤ 0.05 considered statistically significant. The main study (Assessing tuberculosis disease prevalence in Ghana through a population based survey) obtained ethical approval from the Institutional Review Board (IRB) of Noguchi Memorial Institute for Medical Research (NMIMR) [FWA 00001824; IRB 00001276]. Out of 361 culture positive mycobacterial isolates, 159 (44%) and 202 (56%) were obtained from male and female participants respectively. Based on the BD MGIT™ TBc Identification Test Kit, 165 (45.7%) were identified as MTBC whiles 196 (54.3%) were suspected to be NTM. The mean age of culture positive participants were 47.4 years and 45.9 years for MTBC and NTM respectively. Background characteristics of participants from whom mycobacterial isolates were obtained have been summarized in Table 1. Out of 165 MTBC isolates differentiated, 161 (97.6%) were identified as M. tuberculosis while 4 (2.4%) were M. africanum. Other members of MTBC such as M. bovis and M. microti that has been reported to cause disease in humans were not identified (Table 2). Out of 165 MTBC isolates, 133 (80.6%) were susceptible to both isoniazid (INH) and rifampicin (RIF), 31 (18.8%) were resistant to either INH or RIF while the DST status of the remaining 1 (0.6%) could not be determined (assay yielded an indeterminate result) (Fig. 1). The resistance pattern was 18/165 (10.9%), 2/165 (1.2%) and 11/165 (6.7%) for INH monoresistance, RIF monoresistance and multi-drug resistance-MDR (resistant to both INH and RIF) respectively. One out of two RIF monoresistant isolates had mutations in codon 530–533 resulting in the absence of wild type band (WT8) without the presence of the corresponding mutation band whiles the other showed no mutation in the wild type but MUT 3 (S531 L) mutation (Table 3). For INH monoresistant isolates, mutations in katG MUT1 (S315 T1)-only was the most frequent, making up 14/18 (77.8%) while the remaining 4/18 (22.2%) had mutations in inhA MUT1 (C15T) with the absence of corresponding WT1 (−15/−16). None of the INH monoresistant isolates had mutations in both katG and inhA. The most frequent mutations found in MDR isolates were D516V [6/11 (54.5%)], S315 T1 [10/11 (90.9%)] and T8C [6/11 (54.5%)] in the rpoB, katG and inhA respectively. Other mutations in rpoB included S531 L 1/11 (9.1%) and H526Y 3/11(27.3%) (Table 3). Out of 196 isolates suspected to be NTM, 120 (61.2%) were identified completely to the species level. Among these were M. fortuitum 42 (21.4%), M. intracellulare/ M. chimaera 27 (13.8%), M. mageritense 9 (4.6%), M. abscessus 8 (4.1%), M. gordonae 7 (3.6%), M. lentiflavum 7 (3.6%), M. scrofulaceum 6 (3.1%), M. asiaticum 4 (2.0%), M. goodii 4 (2.0%), M. interjectum 2 (1.0%), M. perigrinum 2 (1.0%), M. avium 1 (0.5%) and M. smegmatis 1 (0.5%). The remaining 76 (38.8%) could not be identified completely using both GenoType CM and GenoType AS. Based on individual band pattern and the use of interpretation chart from the kit manufacturer, these isolates were only identified as Mycobacterium species 24 (12.2%) and High G + C Gram positive bacterium 37 (18.9%) whiles the remaining 15 (7.7%) did not correspond to any of the band patterns described in the interpretation chart (Fig. 2). Thirty six NTM isolates comprising M. avium complex (M. avium-1; M. intracellulare/ M.chimaera-27) and M. abscessus complex (M. abscessus subsp. abscessus − 2; M. abscessus subsp. massiliense-6) species were susceptible to both macrolides (clarithromycin, azithromycin) and aminoglycosides (kanamycin, amikacin, gentamicin) when DST was performed (Table 4). This study primarily set out to differentiate species of mycobacterial isolates obtained from TB prevalence survey in Ghana and to determine their resistance to some antimycobacterial drugs using commercially available LPA, the GenoType Mycobacterium Assays (Hain Life sciences, Nehren, Germany). The background data shows that culture positive MTBC isolates were higher in male participants 91 (55.2%) than females 74 (44.8%) [p < 0.001] which is consistent with reports from other studies [1, 14, 15]. Unlike MTBC, more isolates from females than males were identified as NTM which is consistent with report by Limo et al. . A vast majority of MTBC isolates were identified as M. tuberculosis with very few M. africanum. This finding agrees with reports from many parts of the world [1, 14, 17]. The absence of M. bovis among isolates especially those collected from the northern and upper regions was unexpected since consumption of raw milk and pastoral activities are very common in these areas. Getahun and colleagues reported similar findings from their study in Ethiopia . Determining drug resistance profile of mycobacterial isolates is very critical for effective management of the disease they cause. As expected, over 80% isolates were susceptible to both isoniazid and rifampicin because of the community-based study population from whom these isolates were obtained. Prevalence of drug resistance has been reported to be relatively low in community-based studies compared to health facility-based studies. In this study, INH monoresistance (10.9%) was relatively higher than RIF monoresistance (1.2%) which is consistent with general observation although the reverse has been reported from a study in India where out of 279 smear positive samples, 29 (10.4%) and 62 (22.2%) showed INH monoresistance and RIF monoresistance respectively . Eleven out of 165 (6.7%) MTBC isolates were resistant to both INH and RIF, and thus met the definition of MDR-TB, a potential threat to public health considering the study population involved. However, taking into account the small sample size (N = 165) involved, this finding could not be generalized. An MDR rate of 2.2–2.5% have been reported in previous studies in Ghana [6, 20, 21]. Recently, WHO recommended that rifampicin resistant TB (RR-TB) patients should be given the same treatment regimen as MDR-TB . Common mutations associated with RIF rpoB (D516V, H526Y and S531 L) and INH katG (S315 T) resistance found in our study compares with what exists in other settings [22–24]. In this study, more than half (61%) of the isolates suspected to be NTM were identified to the species level although other studies have reported as high as over 80% species level identification of NTM using GenoType Mycobacterium CM and GenoType Mycobacterium AS [25, 26]. The remaining isolates which were identified only as Mycobacteria species and High G + C Gram positive bacteria as well as those whose band pattern did not correspond to the interpretation chart could be identified through sequencing. NTM-DR determines M. avium complex and M. abscessus complex resistance to macrolides and aminoglycosides. In addition, the assay enables differentiation between M. intracellulare and M. chimaera as well as identification of subspecies of M. abscessus. Infections caused by these NTM are difficult to treat and the various species and subspecies within the complexes differ in drug resistance and treatment outcomes . Our study had some limitations. Firstly, the lack of phenotypic testing to compare with the molecular testing used in this study. Secondly, our inability to test resistance to the other first line drugs as well as second line drugs. Lastly, though some of the most pathogenic NTM were identified by the kit, some could still not be completely identified to the species level. Our study showed that the predominant mycobacterium species causing TB in Ghana is M. tuberculosis. Resistance against isoniazid and rifampicin are commonly associated with mutations in the katG (Ser315Thr) and rpoB (Asp516Val) respectively. Diverse species of NTM including M. avium complex and M. abscessus complex were identified. Besides, all species and subspecies of M. avium complex and M. abscessus complex respectively were susceptible to macrolides (clarithromycin, azithromycin) and aminoglycosides (kanamycin, amikacin and gentamicin). Our research signifies an important contribution to TB control in terms of knowledge of the types of mycobacterium species circulating and drug resistance patterns in Ghana. The authors are grateful to all study participants as well as staff involved in the TB prevalence survey. Samuel Ofori Addo was supported by a WACCBIP-World Bank ACE Masters/PhD fellowship (ACE02-WACCBIP: Awandare). Part of this work was used for his MPhil Thesis. The study was funded by Afrique One Consortium (Wellcome Trust - WT087535MA), Afrique One-ASPIRE (107753/A/15/Z) and the Ghana National Tuberculosis Programme (funded by the Global Fund). KKA came out with the study design and contributed reagents and materials. Supervised the laboratory work and contributed to the writing and editing of the manuscript. SOA performed the laboratory work, contributed to the manuscript writing and data analysis. GIM assisted with the laboratory analysis and manuscript writing. LM contributed to data analysis and editing of the manuscript. FAB contributed to the study implementation by providing reagents and equipment. All authors read and approved the final manuscript before submission. World Health Organization. Global tuberculosis report 2015, Geneva, Switzerland. http://apps.who.int/iris/bitstream/10665/191102/1/9789241565059_eng.pdf. Accessed 7 Oct 16. Instructions for Use for GenoType Mycobacterium MTBC. http://www.hain-lifescience.de/include_datei/kundenmodule/packungsbeilage/download.php?id=981. Accessed on 10 Aug 2017. Instructions for Use for GenoType Mycobacterium MTBDRplus. http://www.hain-lifescience.de/include_datei/kundenmodule/packungsbeilage/download.php?id=936. Accessed on 10 Aug 2017. Instructions for Use for GenoType Mycobacterium CM. http://www.hain-lifescience.de/include_datei/kundenmodule/packungsbeilage/download.php?id=776. Accessed on 10 Aug 2017. Instructions for Use for GenoType Mycobacterium AS. http://www.hain-lifescience.de/include_datei/kundenmodule/packungsbeilage/download.php?id=72. Accessed on 10 Aug 2017. Instructions for Use for GenoType Mycobacterium NTM-DR. http://www.hain-lifescience.de/include_datei/kundenmodule/packungsbeilage/download.php?id=981. Accessed on 10 Aug 2017. Kehrmann J, Kurt N, Rueger K, Bange F-C, Buer J. GenoType NTM-DR for identifying Mycobacterium abscessus subspecies and determining molecular resistance. J Clin Microbiol. 2016; doi:10.1128/JCM.00147-16.